Join local artists and Jenna Crowder, a Portland, Maine-based artist and writer, for a conversation exploring the importance of critical discourse around visual arts practices and how having such discourse enhances the exchange of ideas in artistic communities. Ms. Crowder will introduce her online arts journal The Chart and discuss the forms of critical writing the publication supports. This free event is part of a cooperative effort between RAW, Artspace New Haven, Franklin Street Works in Stamford, with the intention of launching a shared online journal of experimental, expository and critical writing. Real Art Ways, Artspace New Haven, Franklin Street Works and The Chart are members of Common Field, a visual arts organizing network that has provided a grant to support this program. Jenna Crowder is a Portland, Maine-based artist and writer. 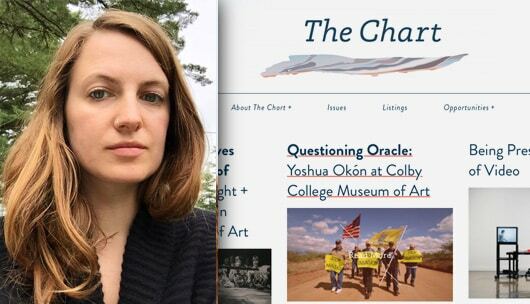 She is the Founding Editor of The Chart, an arts journal that aims to connect Maine artists to national and global contexts while offering specific regional perspectives to larger conversations. Jenna favors collaboration in her artistic practice, which extends across installation, printmaking, public practice, and curation to consider the convergence of written language and visual aesthetics. She is a co-creator, with writer Nadia Prupis, of MTV Crits!, a serial project which hosts themed music video screenings and socio-feminist pop culture critiques at art institutions, lingerie shops, and bars. Jenna has been awarded residencies from Hewnoaks Artist Colony, Ragdale Foundation, and the Stephen Pace House, and project grants from the Kindling Fund and the Maine Arts Commission. She is a member of Pickwick Independent Press and the Portland Public Art Committee. Learn more at Ms. Crowder’s website.